FIBO STEEL - I never wanted to be your whole life. Just your favorite part. Environmental protecting Stainless Steel has increasingly grown as a popular metal choice for jewelry.It's Safe Material,so there no need to worry weather it will do harm to your health.Shiny appearance and good glossiness,it also can keep its original color at the room temperature and keep the shape in the long term. 4 Pairs in a Set,One Order Equal to 4,the Most Economical Set for You,Deserve to Purchase. Made of High Quality 316L Stainless Steel,Harmless to Huamn Body,Great Electroplated Workmanship,Lasting Color Retention. AAA+ Shiny Cubic Zirconia,Elegant and Trendy,Perfectly Suit to Men or Women,Great Gift to the One You Love. 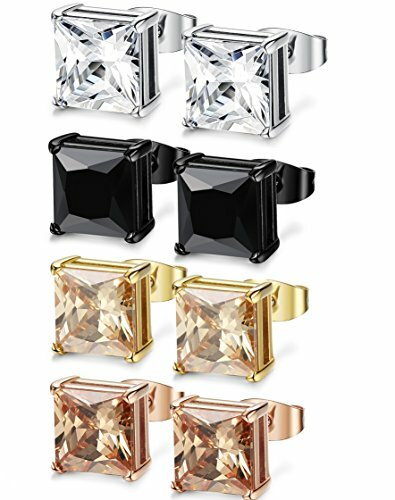 The Same Style 4 Pairs Earrings in Different Color,Meeting Your Dailylife Needs in Different Occasion,Make Your Dailylife More Colorful. If you have any questions about this product by FIBO STEEL, contact us by completing and submitting the form below. If you are looking for a specif part number, please include it with your message.